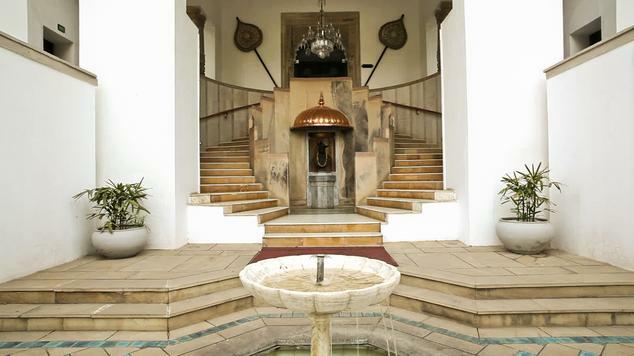 Hotel Usha Kiran Palace is a heritage hotel in Gwalior that belongs to the Taj Group. 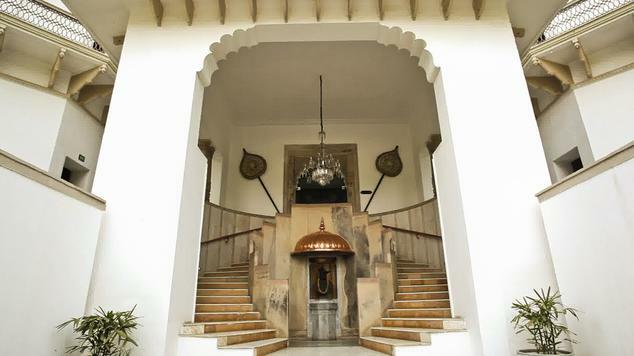 Built as a guesthouse by the Maharaja of Gwalior, the hotel has a historical significance of being a 120 year old palace. 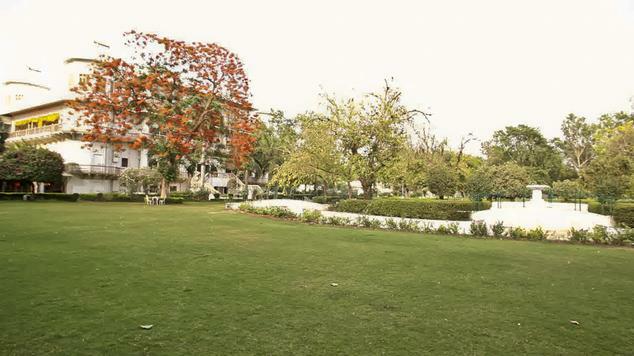 The hotel is 25 km from the Gwalior Airport and a mere 3 km from the railway station. The hotel has various places like Gwalior Fort, Jai Vilas Palace, Jain Shrines, Tansen Tomb, Suraj Kund and Sarod Ghar Museum of Music. 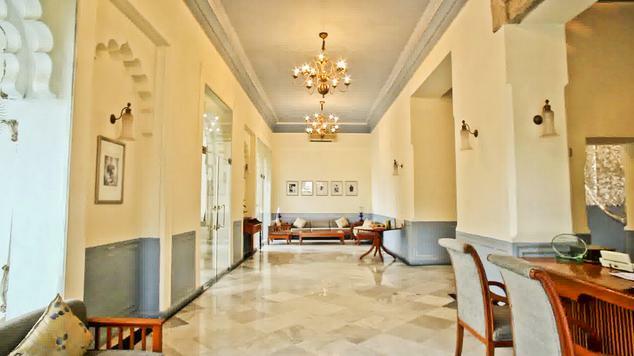 The hotel is a blend of tradition and modernity which is reflected by its architecture as well as its hospitality. The amenities offered include a fully equipped business center, car rental (surcharge), currency exchange, travel desk, airport shuttle (surcharge), babysitting services, doctor on call, laundry and dry cleaning services, florist, parking facility and 24 hour front desk. 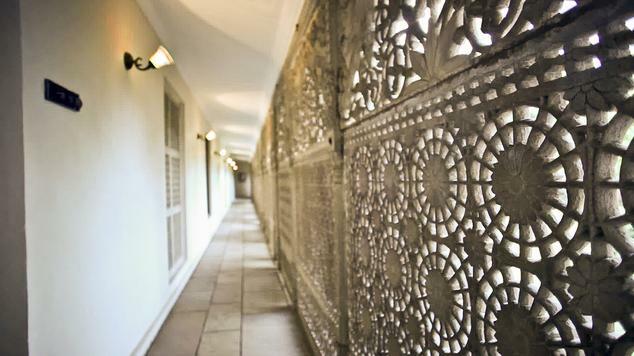 The hotel’s health club and Ayurvedic center is the place to go to relax and rejuvenate. 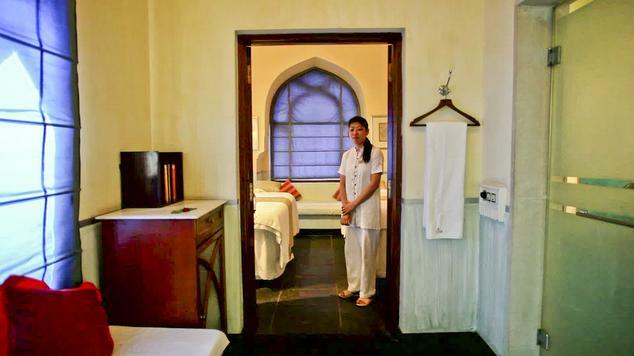 The Jiva Spa offers relaxing massages and therapies inspired by ancient Indian techniques and tradition. The hotel also offers aerobics, yoga, billiards, table tennis, badminton, cooking classes and sightseeing trips for recreation. All the rooms have a stylish, modern décor with stunning views of the surroundings. 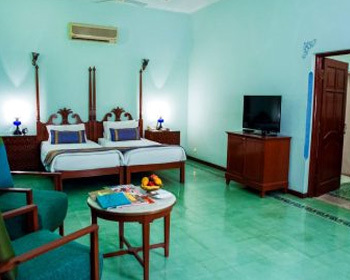 The rooms are well equipped with facilities such as satellite television, STD/ISD direct dial facility, mini-bars (surcharge), Wi-Fi access, air conditioning, work desk, hair dryer and 24 hour room service. The bathrooms have shower, bathtub and bath accessories. Non-smoking rooms are available. These rooms are airy and have vivid interiors equipped with all the contemporary conveniences including color TV with cable programming, air conditioning, high speed internet, international direct dial telephone facility, work desk, mini-bar (surcharge) and 24 hour room service. All rooms have attached baths well-appointed with bathtub, shower and bath essentials. Non-smoking rooms are available on request. Size – 675 sq. ft. 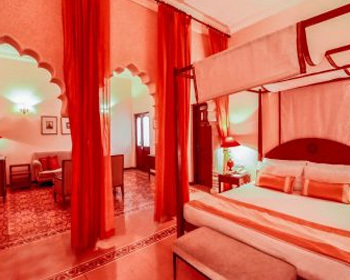 The suites have a modern and classy design yet they reflect the local tradition and culture in the furnishings and detailing like the silk drapery and vibrant hues. 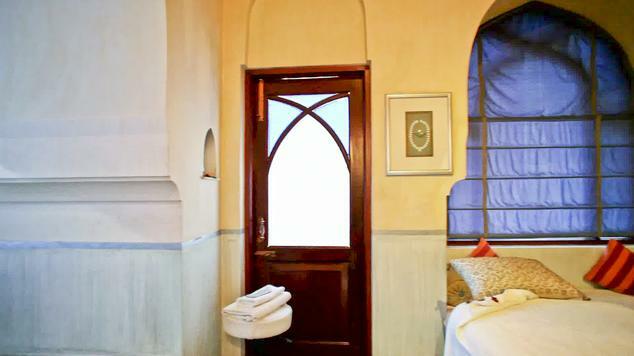 The two royal suites namely Chand Niwas and Suraj Niwas are luxurious and offer mesmerizing vista of the Gwalior Fort and the Jai Vilas Palace. The suites are replete with amenities such as satellite television, direct dial telephone, mini-bar (surcharge), wireless internet access, work desk, air conditioning and private bath with shower, bathtub and essential toiletries. Round the clock room service is provided. The Luxury Suites are lavish and comfortable with beautiful furnishings and a separate living room. The amenities include air conditioning, cable television, telephone with STD/ISD direct dial facility, work desk, Wi-Fi connectivity, mini-bar (surcharge), 24 hour room service and private bathroom with shower, bathtub and bath accessories. 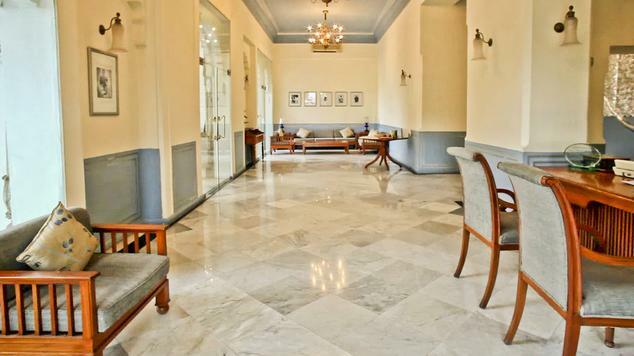 The Villas are extravagant and inclusive of all the comforts and amenities that make for a luxurious stay. The Villas have their own personal swimming pool and sunbathing area. The facilities offered are international direct dial facility, color television with satellite channels, air conditioning, work desk, wireless internet accessibility, mini-bar (surcharge) and round the clock room service. The private bath is spacious and well-appointed with shower area, bathtub and bath essentials. 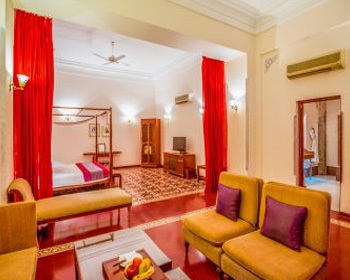 Hotel Usha Kiran Palace in Gwalior is adorned with exquisitely decorated rooms, colored in shades that would match your choice. 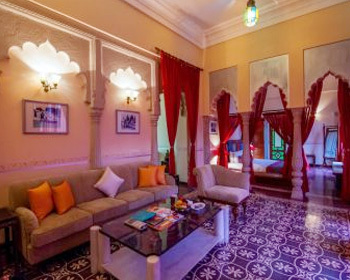 The rooms are spacious and well decorated with ethnic furniture that have a touch of aristocratic splendor. 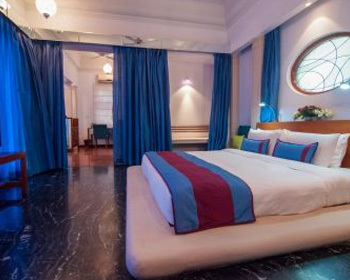 The beds are aligned in a way so as to ensure maximum air from the air conditioner or from the ceiling fan placed right above the top of the bed. Beds are made of soft cushions and equally soft mattresses which would erase all your tiredness. 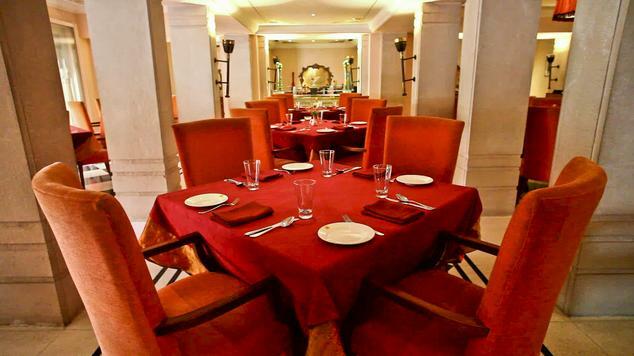 The hotel’s restaurant specializes in the cuisines of the Maratha and Nepal royalty, thus reviving history and ancient culture. 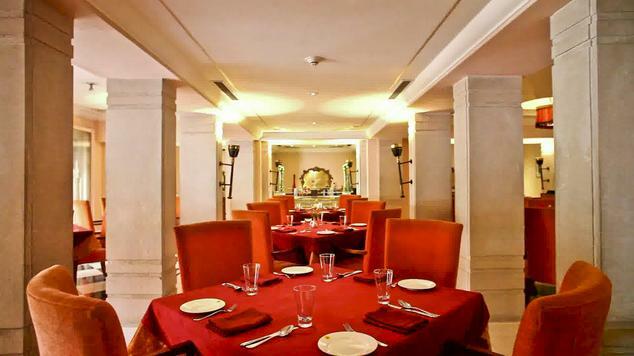 The diners also have the choice of Asian, Continental and Indian cuisines. 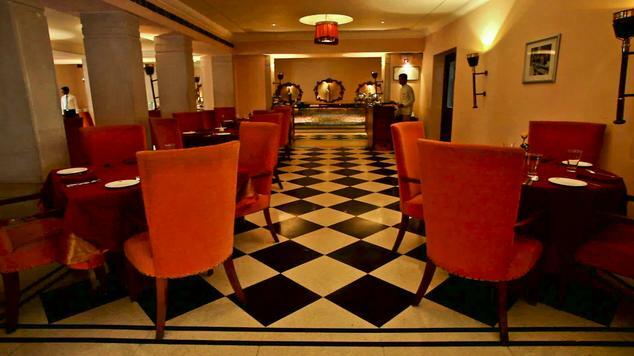 The food is personally prepared and the tunes of the classical Gwalior Gharana enhance the culinary experience. Whether you try the Shahi Murg ka Tikka or the Nepalese Daal ko Suruwa, the flavors are sure to stay behind and influence your senses. The bar features some of the finest wines and spirits to accompany the food. Once here, you are in for a complete royal experience. 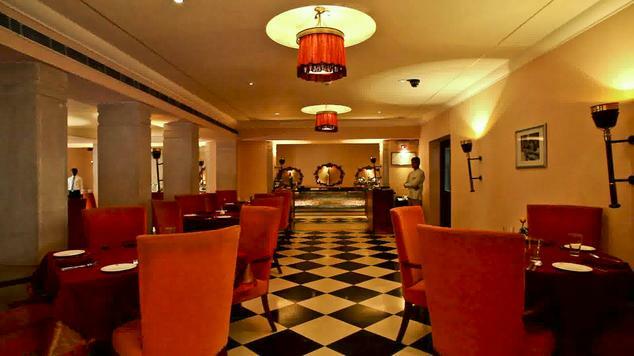 The Bada Bar serves a wide range of domestic as well as international liquor and has a nice ambience to it. The place has a huge billiards table that gives it a casual and lively feel. The Court is the courtyard café with an alfresco dining option in the middle of beautiful natural surroundings. 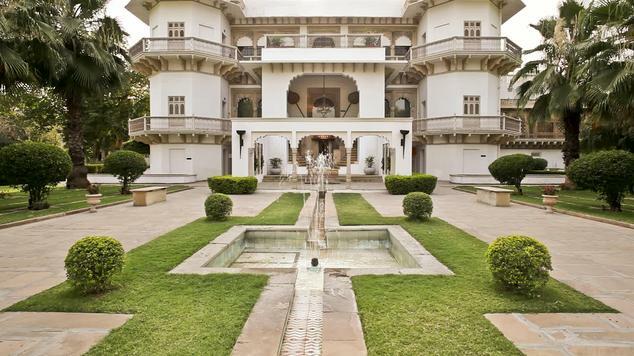 One can choose the setting between the palm-shaded courtyard and the verandah. 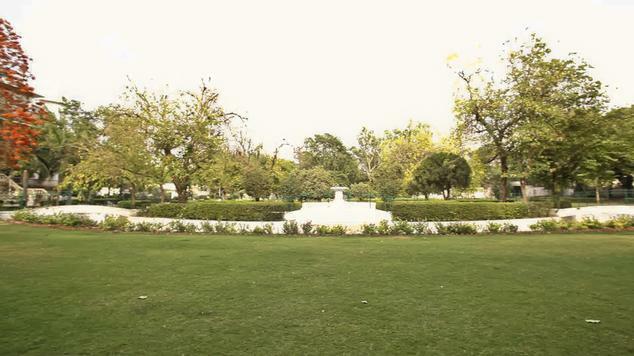 The picturesque greenery makes for a pleasant dining experience. 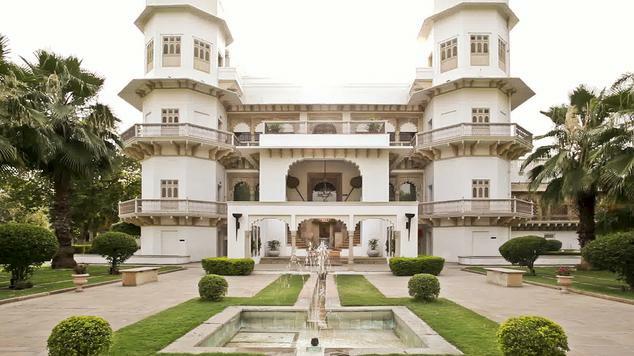 Rejuvenation is truly a royal affair at Jiva Spa in Usha Kiran Palace, Gwalior. Here, treatments and therapies are so designed that body, mind and soul indulge into a soothing experience. 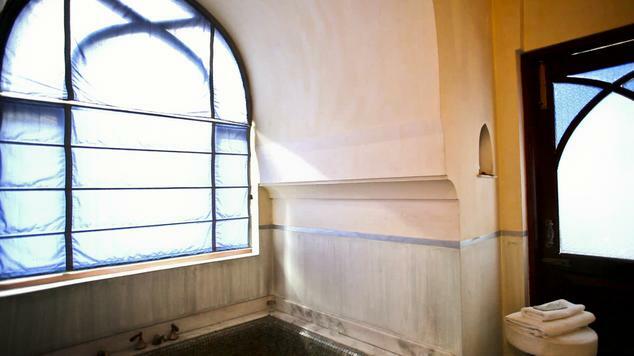 It is the one stop destination for enjoying some of the finest couple treatments and ancient Indian bathing experience. Other treatments which are offered here are listed below. Jivaniya – Best way to relieve the muscle tensions. Mangal Snan – An award winning signature treatment which is best taken before a wedding or an important occasion. Shudhikara – It detoxifies mind and body. Pehlwan Malish – It comprises of a traditional dynamic massage. Champi– Champi proves to be beneficial for promoting hair growth and restoring natural shine. Sammardana– It is a skillful method for relieving the body stress. 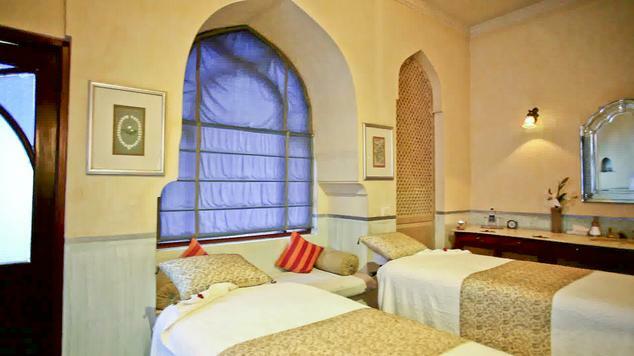 Prishta Mardana– It includes a massage, deep cleansing, exfoliation and herbal mask. The therapy works well for stress induced in back and shoulders. Pada Mardana– It is an ancient foot massage for relieving the tired soles. Vishram – It is chosen to ease the muscles and get rid of any impending stress. Orja Dayaka – Deep muscular massage to re-energize the body and refresh the muscles. Pavithri – A unique blend of oils used to liberates the impurities of the body. Masala – A scrub made from traditional Indian spices is applied on the entire body to improve bold circulation. Mocha Patra – It aids in removing the impurities of the skin. Narikela – A rejuvenating experience using the natural goodness of coconut. Prthivi Mrit – This process involves applying a wrap made from the 22 exotic Indian herbs and clay on the entire body. Anana Lepa – This ‘Lepa’ uses common ingredients easily available in any Indian kitchen. Dev Nidra – It includes a relaxing bath followed by an aromatherapy massage. Soma – A romantic candlelit aromatherapy massage and a rose petal bath await for you and your partner. All these treatments are worth trying at least once and are sure to provide you complete rejuvenation.